Included high quality phono amplifier allows you to connect the BDT-2500 to any line level input jack of your mixer or preamplifier. Phono inputs are hard to find on modern stereo systems but they are not needed to use the BDT-2500. Two pitch control volumes, main pitch and fine pitch controls, allow you to set the speed from 16rpm to 98rpm continuously. 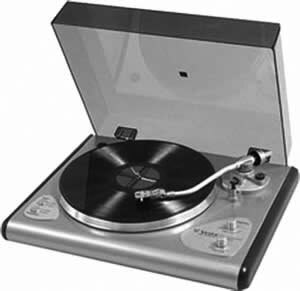 This allows for playback of vinyl in any format (LP, EP, SP) or the pitch can be changed from super slow to super fast. The static balanced S-shaped tone arm is designed with the experience of high end professional turntable design, allowing maximum tractability and durability. Unique heavy-duty metal chassis minimises the feedback from vibration. Vestax BDT-2500 / BDT2500 owners manual, service manuals and schematics are for reference only and the Vinyl Engine bears no responsibility for errors or other inaccuracies. The PDF files are provided under strict licence. Reproduction without prior permission or for financial gain is strictly prohibited. This website is not affiliated with or sponsored by Vestax.